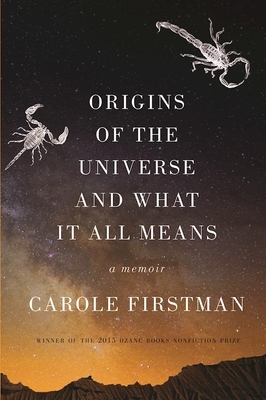 In her debut memoir, Carole Firstman traces her strained relationship with her eccentric and distant father, a gifted biology professor whose research on scorpions may have contributed to the evolutionary theories of Stephen Jay Gould. Through unexpected forms--from footnotes and diagrams to startling love letters and Saturday morning cartoons--Firstman struggles to reconnect with her estranged father and redefine herself as both a grown woman and a daughter. Part travel narrative, part cultural commentary, this genre-bending memoir contemplates the nature of parent-child relationships, the evolution of life on Earth, and origins both physical and metaphysical. Excerpts from this work have appeared as Notable Essays in several Best American Essays collections. Carole Firstman is an essayist, memoirist and journalist. Her writing has appeared in numerous magazines, newspapers and literary journals including Colorado Review, South Dakota Review, Watershed Review, Defunct Magazine, Reed Magazine, Man in the Moon: Essays on Fathers and Fatherhood, Lifestyle Magazine, Baja Life, Valley Response, and The Valley Voice. She received a Pushcart Prize Special Mention and her work has twice been noted in Best American Essays. Her forthcoming book, Origins of the Universe and What It All Means: A Memoir, is about the complications of familial relationships. She teaches at College of the Sequoias and California State University, Fresno and lives in Visalia, CA.